Date Night gets reacquainted with an old friend: a restaurant that we have been going to for years, but have not visited in a long time. 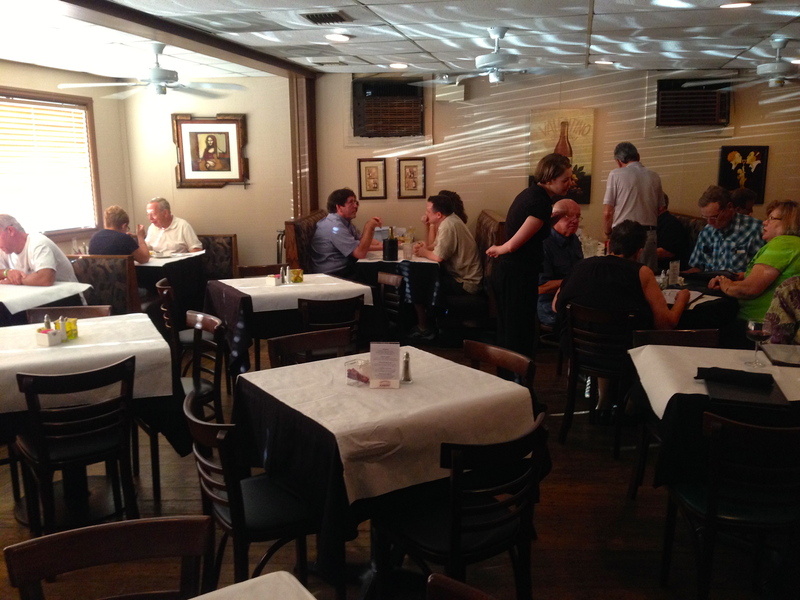 Back in 1989, an old house on Johnson’s Ferry Road in East Cobb was converted into La Strada. Twenty-five years later, this area has become one giant shopping center, but not much has changed at La Strada, including the decor. Evidently, back in the late 1980’s, food reviews were done in print, and not online. Can you imagine? La Strada still has those reviews posted, including some from the long-defunct “Knife and Fork”, which was the Urbanspoon of the day. As you would expect, there are also old pictures of the owner with various celebrities. It looks like Bobby Cox and Hank Aaron are big fans of the restaurant. And so is Date Night. Let’s have some wine and talk about it. We are meeting our solo offspring for dinner, and while he sits in traffic, we sit at the bar and have a glass of wine. Like many Italian restaurants, the craft beer revolution has passed by here and the beer list is, shall we say, uninspiring. 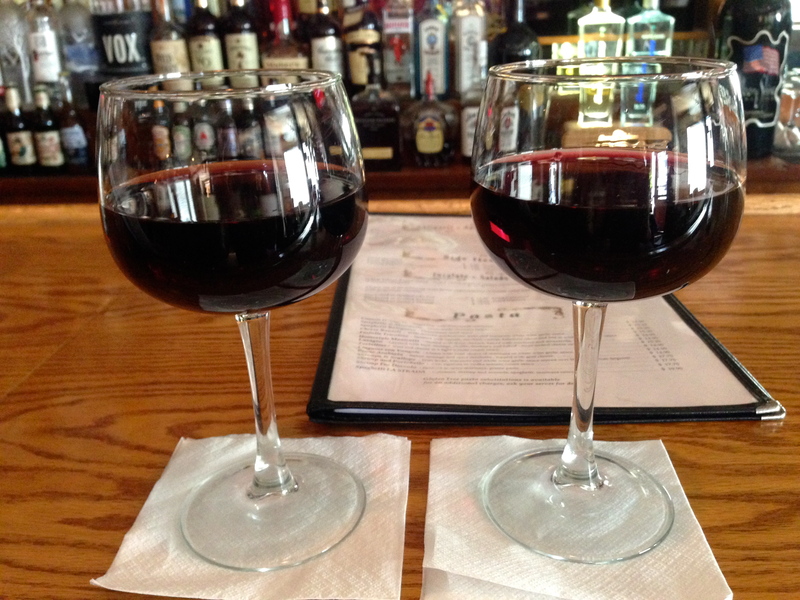 The Italian wines are plentiful and we have a glass of Chianti and a glass of Montelpulciano. Both are good reds that will go nicely with our meal ahead. The dining room is small, and hard to photograph. There are a few more tables in a nook towards the back. It gets crowded as we eat, and among the “celebrities” here are Date Night followers Ann and David, who realize they know what we will be blogging about this week. 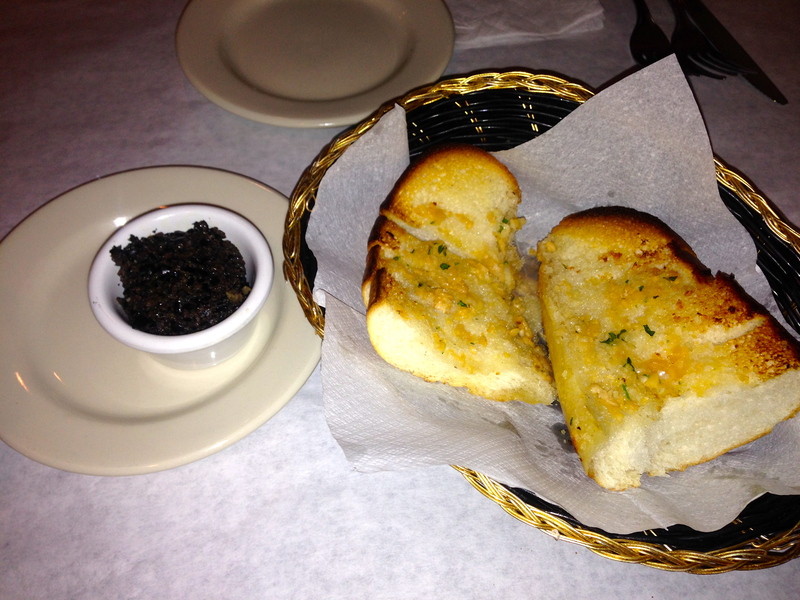 Meals at La Strada begin with bread and some really good tapenade and garlic bread. We paid $5 for this last week at the Foundation Social Eatery, but you can eat all you want for free here. Don’t fill up on it, because, as you will see, the portion sizes are “molto grande”. You also get a salad, with either Caesar or gorgonzola dressing. 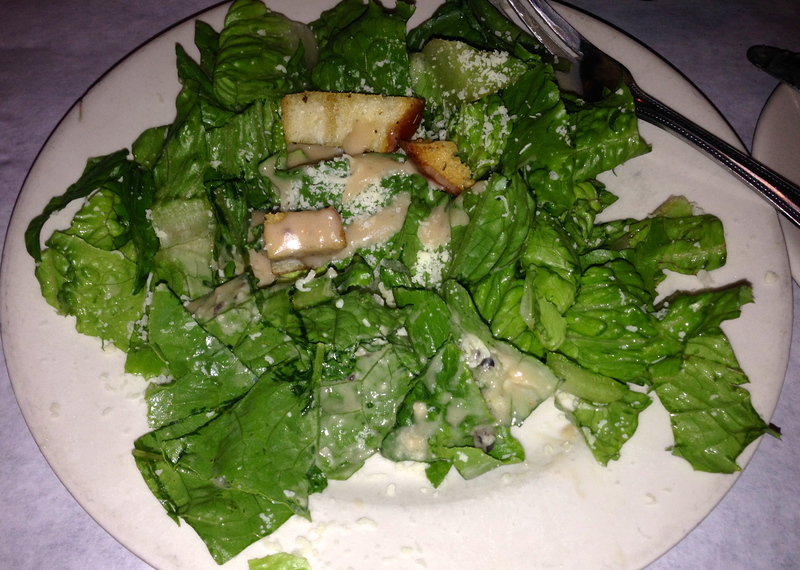 We get our Caesar on the side because restaurants tend to drown their salads in the dressing. We already know what we are having for dinner, but we are hungry. 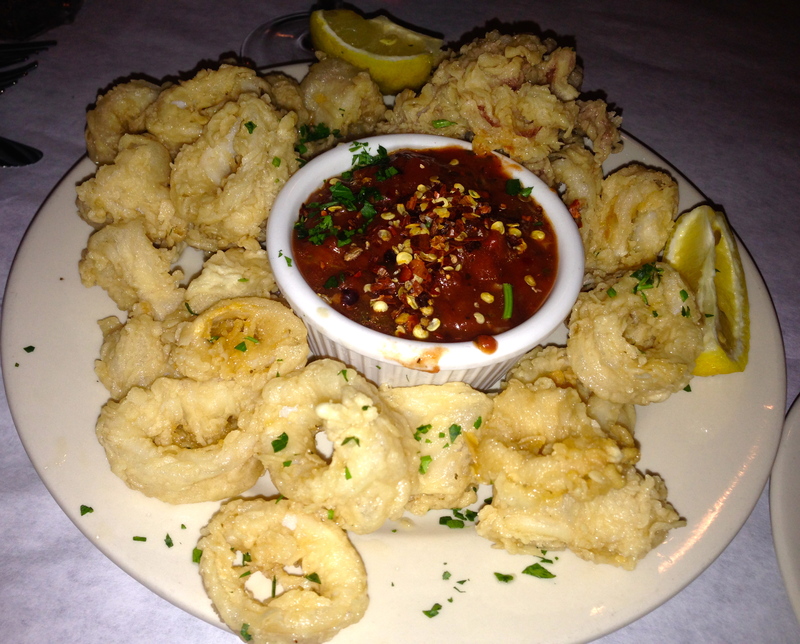 Before the main event, we order the calamari. The breading is light and they know how to cook this here. How do they keep it from becoming greasy? We can barely tell these are fried. 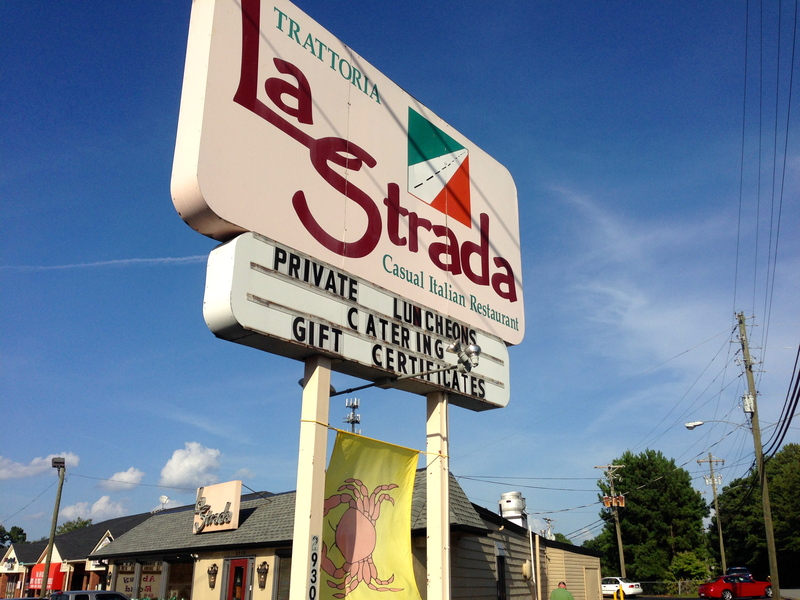 If La Strada has soft-shelled crabs as a special, they put up a flag under their sign so you know they are available. Lucky for us, the flag is flying tonight. Eve and Elliott both order the crabs. They come over a bed of angel hair pasta. The crabs are cooked the same as the calamari. The breading is barely there and the light tomato sauce goes perfect with both the seafood and the pasta. I want the crabs, but if we all get the same thing, we won’t have a lot to write about. Fortunately, Eve promises to share hers. 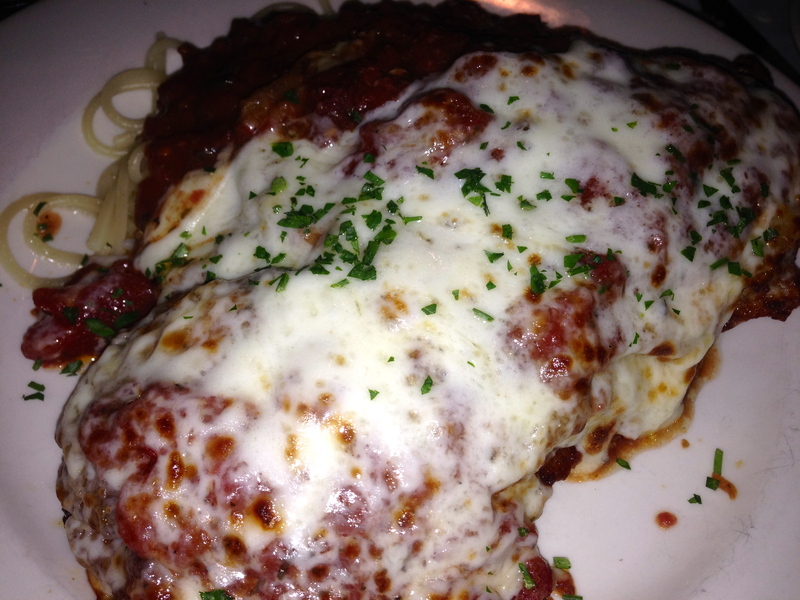 In the spirit of good journalism, I order the stuffed chicken parmigiano. It’s more layered than stuffed, with eggplant and prosciutto hiding under all of that cheese. The huge chicken breast and the side of spaghetti makes this a large, filling, delicious dish. Although we all share, some of this comes home for a future meal. 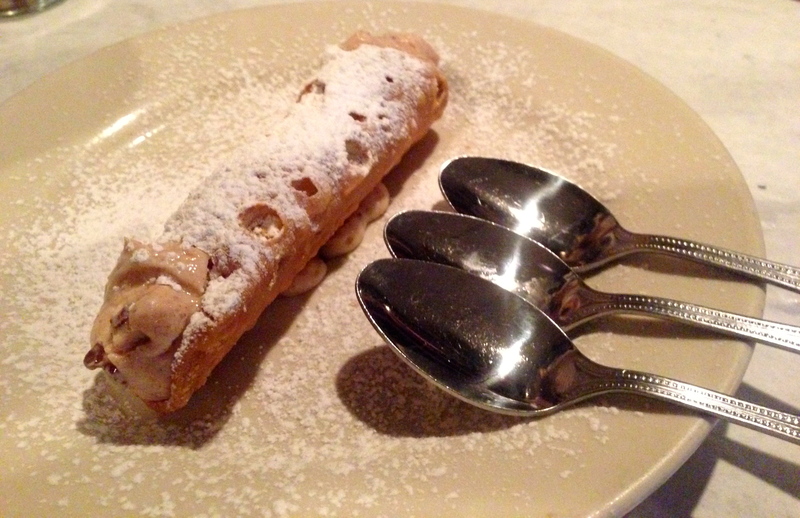 I’m not sure how we have room for dessert, but we decide on the the cannoli. It’s light and full of cinnamon and chocolate chips. Evidently, it’s made from grandma’s recipe and it gives a sweet ending for three very full diners. 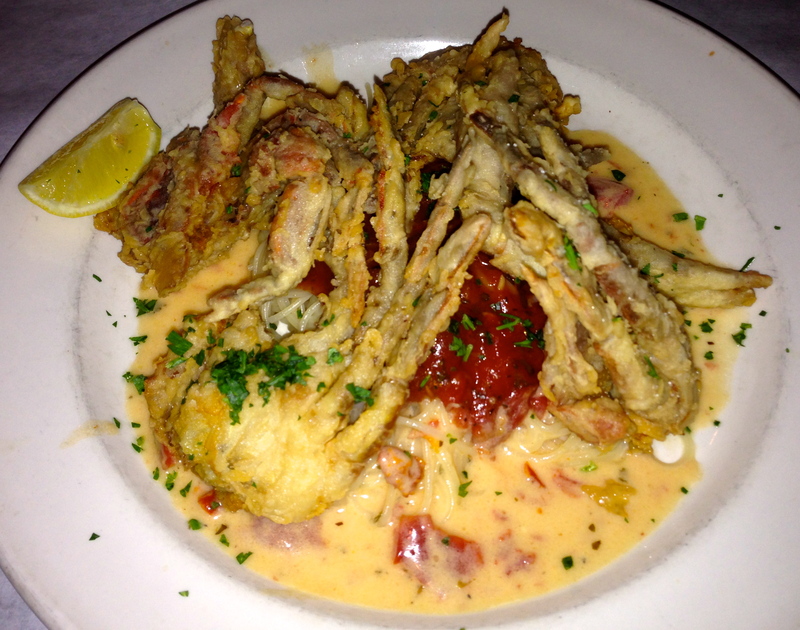 The bottom line on La Strada: Those crabs are as enjoyable now as they were in the early 1990’s, when we first started eating here. At $32 an order, they are also a lot more expensive. However, these crabs are worth it. La Strada must be doing something right because no other East Cobb restaurant has been around this long. 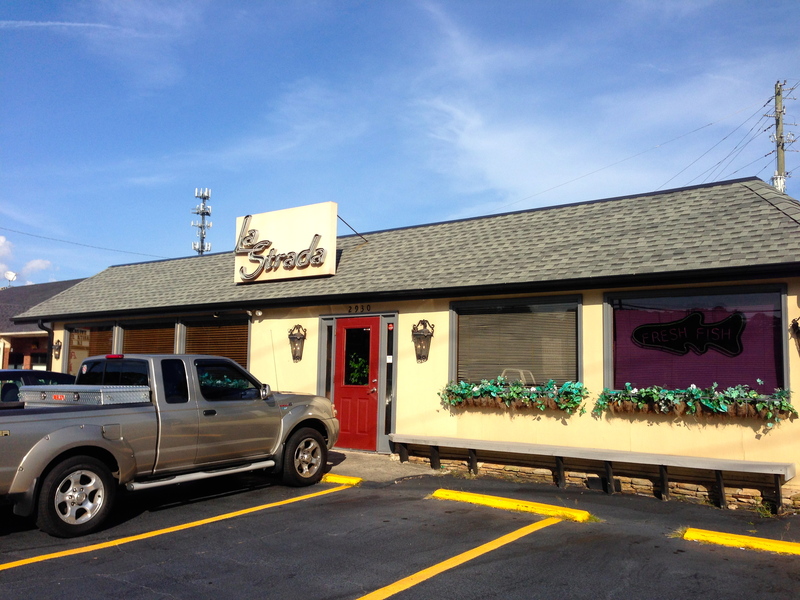 This is an excellent example of old-style Italian dining. 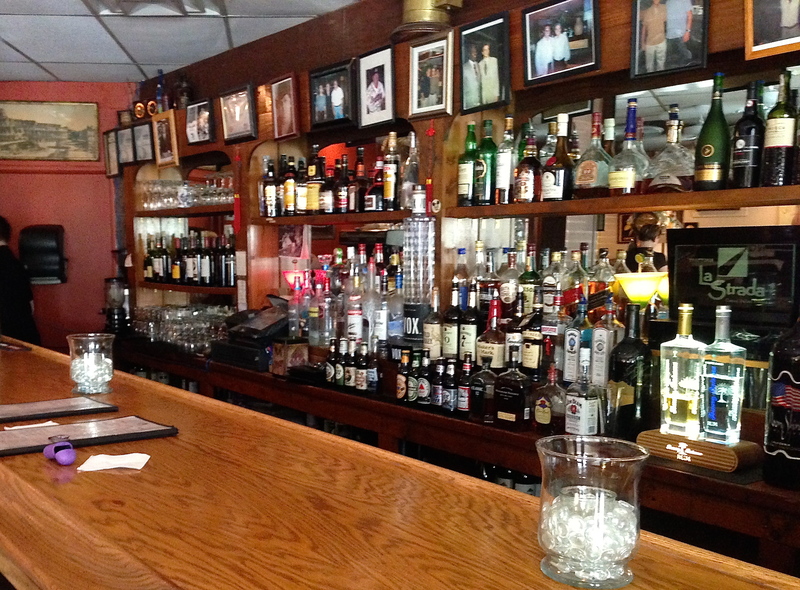 The owner greets you at the door, the service is good, and the regulars come in often. If you haven’t visited lately, you’ll be pleased to know that it’s as good as it was over twenty years ago. If you haven’t been at all, it’s worth a visit to this outside-the-perimeter institution.